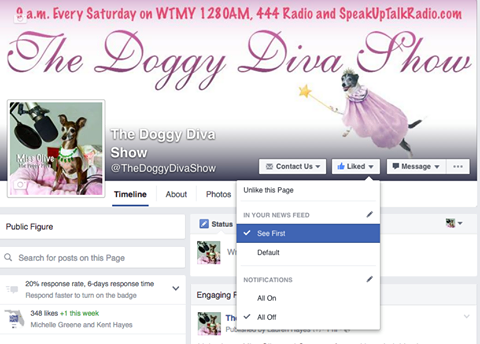 Don’t Miss Another Doggy Diva Post on Facebook! Want to be sure you see ALL of our Doggy Diva Show posts and messages from Olive the Doggy Diva? Be sure to you update your “Follow” settings to “See First” by clicking on the “Liked” tab and selecting “See First” instead of “Default” as show below.